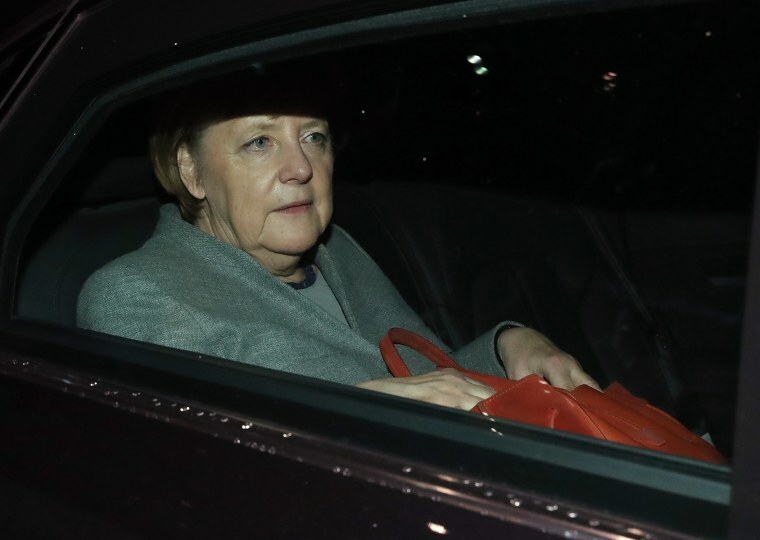 Germany faced an uncertain political future Monday after the collapse of Chancellor Angela Merkel’s talks on forming a new government, raising the prospect of new elections looming. The Sept. 24 election produced an awkward result that left Merkel's two-party conservative bloc seeking a coalition with the pro-business Free Democrats and the traditionally left-leaning Greens. The combination of ideologically disparate parties hadn't been tried before in a national government, and came to nothing when the Free Democrats walked out of talks Sunday night. Merkel said her conservatives had left "nothing untried to find a solution." She said that she "will do everything to ensure that this country is well-led through these difficult weeks." It's likely to be a while before the situation is resolved. The only other politically plausible combination with a parliamentary majority is a repeat of Merkel's outgoing coalition with the center-left Social Democrats — but they have insisted time and again that they will go into opposition after a disastrous election result. If they stick to that insistence, that leaves a minority government — not previously tried in post-World War II Germany — or new elections as the only options. President Frank-Walter Steinmeier will ultimately have to make that decision, since the German constitution doesn't allow parliament to dissolve itself. To get to either destination, Steinmeier would first have to propose a chancellor to parliament, who must win a majority of all lawmakers to be elected. Assuming that fails, parliament has 14 days to elect a candidate of its own choosing by an absolute majority. And if that fails, Steinmeier would then propose a candidate who could be elected by a plurality of lawmakers. Steinmeier would then have to decide whether to appoint a minority government or dissolve parliament, triggering an election within 60 days. Merkel's Union bloc is easily the biggest group in parliament, but is 109 seats short of a majority. Merkel, Germany's leader since 2005, said she would consult Steinmeier Monday "and then we will have to see how things develop." She didn't say more about her plans, or address whether she would run again if there are new elections. "It is better not to govern than to govern wrong," he said.